Scotch Bonnet Lighthouse [also known as Egg Island Light], located offshore to the west of Prince Edward County, is located on Scotch Bonnet Island - 3.5 miles SW of Huyck Point and only seven feet above water level. The island is approximately 0.9 miles southwest of Nicholson Island. 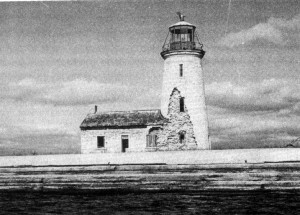 A lighthouse was built of limestone brought from shore to mark the island in 1856. Characteristic and Range: Fixed white, visible for 12 miles. 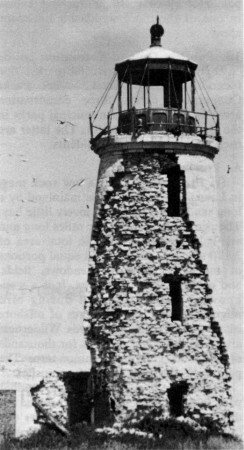 Description of Tower: Conical stone tower. In 1909 the light was replaced with an acetylene gas "vapor light". In 1912, the light was automated and became occulting rather than fixed; 1933 it is reported as occulting one second in every four; in 1948 it is reported as flashing white; a 70 foot above water steel skeleton tower was built in 1959 (43° 53' 58"N 77° 32' 32"W, flash 1/2 sec., eclipse 3 1/2 sec., managed by the Canadian Coast Guard). Crumbling since 1959, the abandoned lighthouse keepers residence was still fairly obvious , but the stone tower and attached residence are little more than ruins [only two walls of the keeper's dwelling remaining in 2001]. There are reports that the Coast Guard tried to pull the tower down at some point. Scotch Bonnet Island is flat and bare with a white skeleton tower 60 feet high and a spit extending 0.3 miles east of the island. 2 miles South of Scotch Bonnet Island lies Scotch Bonnet Shoal which has depths of 12 to 18 feet. The Board of Works have just completed an excellent lighthouse on Egg Island, or the Scotch Bonnet, which is one mile S. S. W. of Nicholas Island. It was lighted for the first time in September, 1856. A bright fixed light, bearing S. E. of Presqu'Isle Light. Can be seen 13 miles. This nearly land locked haven of refuge, when once entered, is perfectly secure from every wind or sea; there is plenty of water with good holding ground; its dimensions are ample for the whole navy of the Lake; it is well lighted; it is easily entered with any wind, except from the N. W.; and when it blows from this quarter, shelter is easily obtained in many other places; yet, from the want of a few beacons or buoys, vessels often keep the open Lake, or run for much less secure places, rather than face the dangers of the shoals. The Underwriters, Forwarders, Shipmasters, and others interested in the navigation of Lake Ontario are about to petition the Government for the construction of a Harbour at Weller's Bay, in the County of Prince Edward. An opening one hundred rods wide, with a channel one hundred and fifty feet wide and fourteen feet deep, has within a few years past, been made through the beach from the Lake to Weller's Bay, which is said to be capable of sheltering all the vessels which navigate Ontario. The entrance to the harbour of Presqu'Isle is difficult and frequently attended with casualties, and it is justly considered necessary to construct a harbour at the place mentioned, which the mariner can safely enter in a storm. Several vessels, as our readers know, were driven ashore within a few miles of Weller's Bay, or, rather the opening leading into it, which might have been saved, had the entrance been known to the masters. There can be no doubt that the Government will entertain the prayer of the petitioners, and immediately take proper steps to erect a Harbour of Refuge to our fresh water seamen, that will serve to encourage them in their arduous and dangerous calling. In fact, "it is the duty of Government to render every aid in facilitating and advancing the interests of marine investments, which contribute so largely to the revenue of the Province and the convenience of the people; and we feel confident the object will be acceded to without any circumlocution or useless delays." Kingston News, Jan. 7, 1857. If the entrance to Weller's Bay was not rendered more dangerous than the entrance to Presqu'Isle Harbour, by the existence of the two shoals to which I have above alluded, the prayer of the petitioners would, in all probability, have the favourable consideration of the Government; but the existence of these two formidable shoals at the very entrance of the bay, exposed as they also are to the full sweep of the Lake, during a south or south-west wind, (the very winds which would render it necessary for vessels to run into Weller's Bay for shelter,) would, I conceive, be an insuperable objection to the expenditure of so large a sum of public money as it would require to make this bay an efficient harbour of refuge during a dark and stormy night. Far better would it be to petition the Government to expend one fourth of the sum in improving the entrance into Presqu'Isle, and which is already well lighted. The shoals, bad as they are, are so land-locked and protected from the heavy surge of the sea, as hardly to endanger any vessel which might be so unfortunate as to get aground on them. The shoals opposite the entrance to Weller's Bay are rocky, and have only from 3 to 5 feet water on them: they are also so exposed, that any vessel running ashore on them during a gale, must soon go to pieces.